Hello people of the internet! 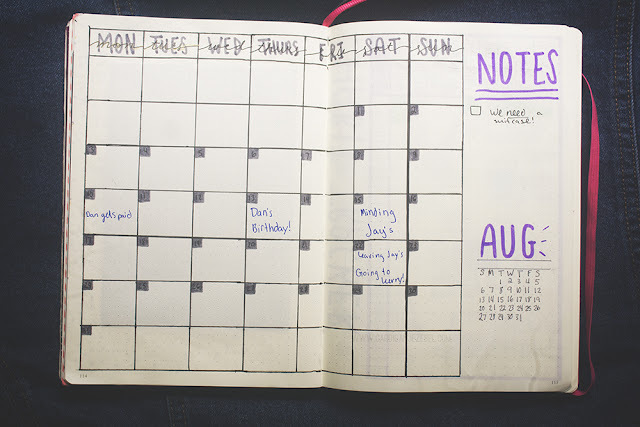 At this point, you've probably all heard about bullet journaling. Either from me (it's been in my favorites a few times now) or from the multitude of buzzfeed articles that are floating around. If you haven't heard of it; let me explain! 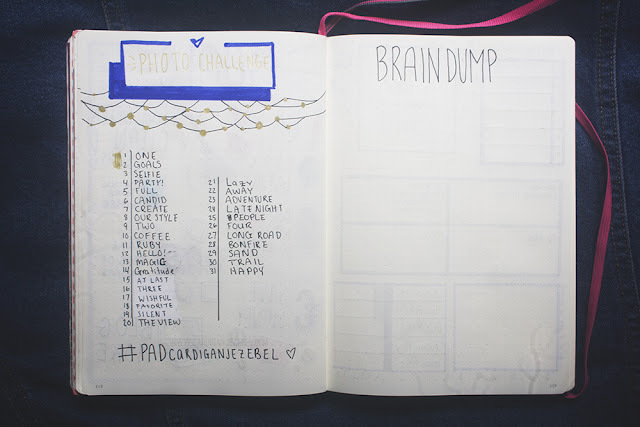 Bullet Journaling is part to-do list, part journaling, and part sketchbook. 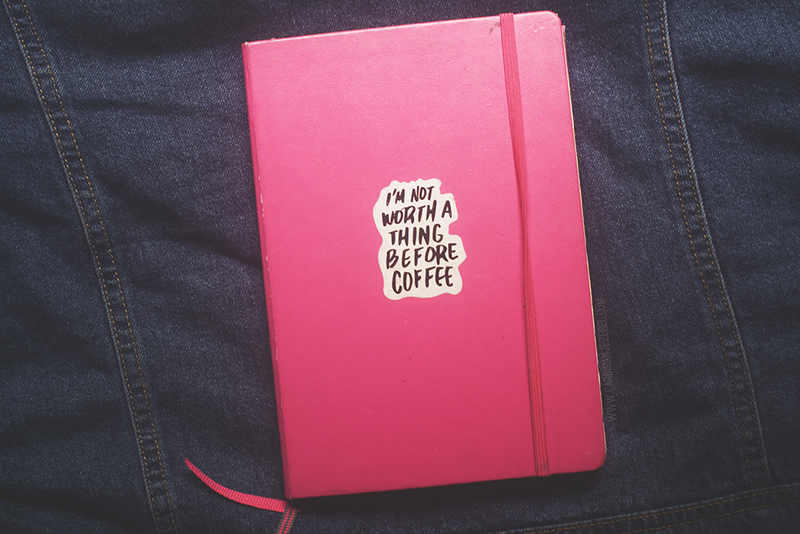 I'm very much a pen & paper type of person when it comes to being organised and using the bullet journal system has completely changed the way I get stuff done. I've been using various notebooks to bullet journal for just about a year and a half now. This pink notebook you can see above is a Leuchtturm 1917 with a dot grid style inside. It's hands down the best notebook that I've used for bullet journaling so far. In fact, I've been using it since January because it works so well for me. 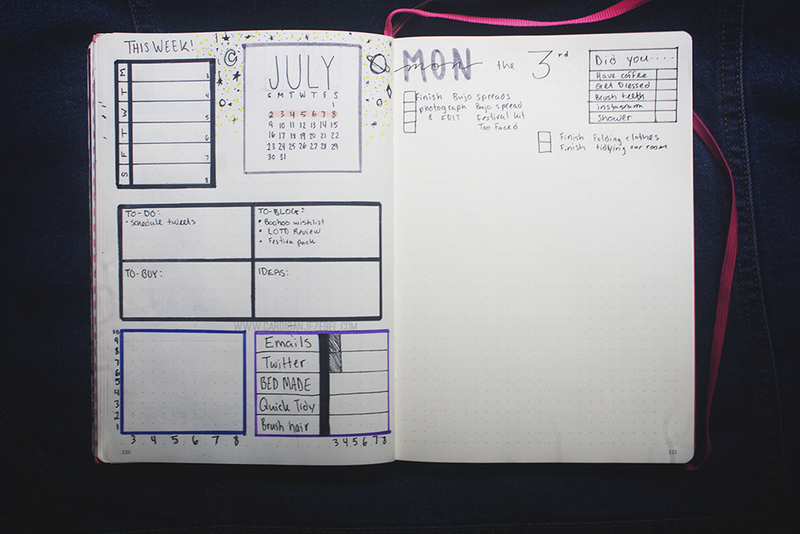 Today, I just want to show you what my July setup looks like. 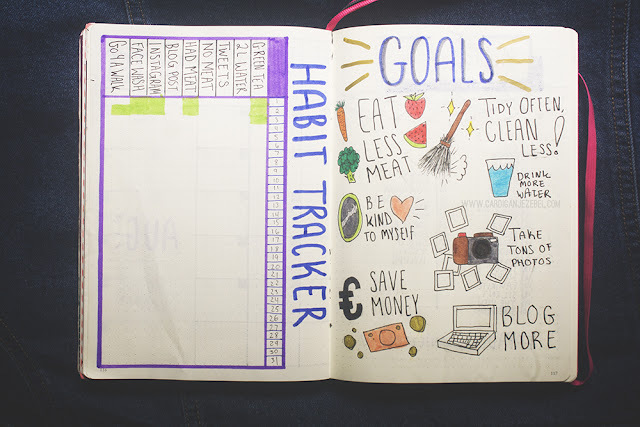 So my monthly spread, habit tracker, goal page, and my first weekly spread of the month! 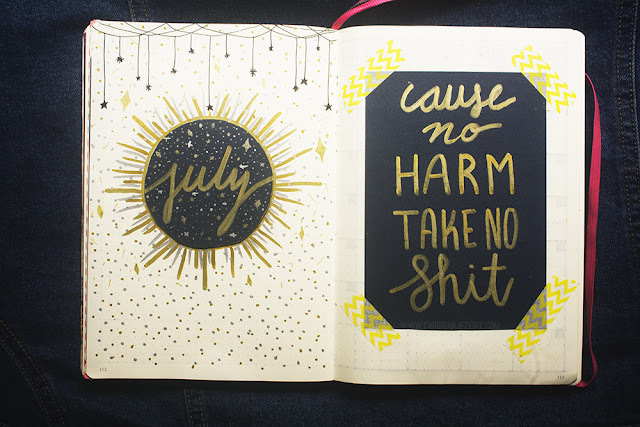 Monthly Spread - So these are the first four pages of my July spread. For the introduction page I decided to try something new. I normally just use my calendar spread for the start of a new month. I love how the July page turned out. The navy, gold and silver work so well together. Then, I decided to write out a quote on a leftover piece of card and tape it onto the other page. My calendar didn't really go as planned. For starters, I accidentally made too many boxes and started the weeks with Monday. But, I only ever use my calendar for a quick overview of the month so I'm not too angry! 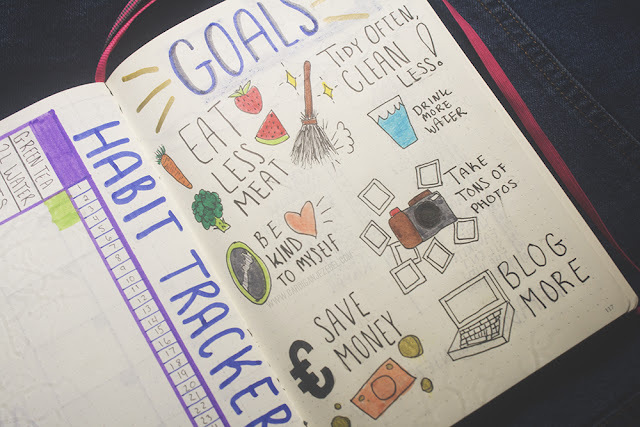 Habit Tracker & Goals - My tracker is pretty simple. I included a close up for people who are always looking for stuff to track! I know I am. My goal page is a completely new to me. 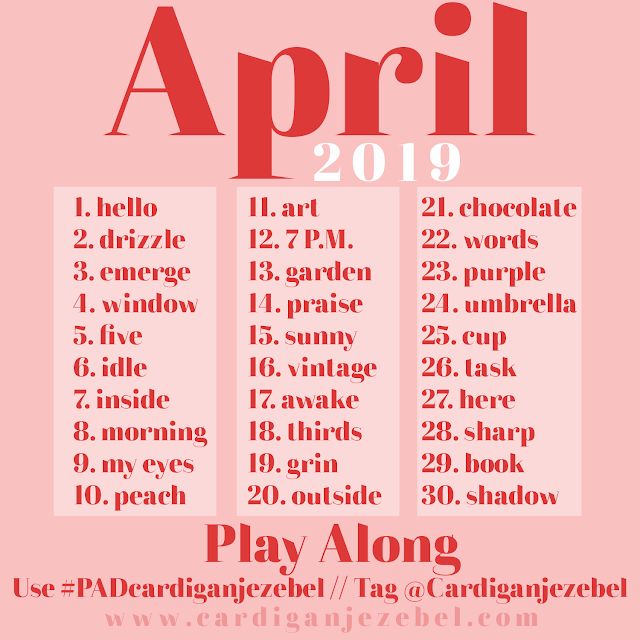 I usually just jot down things I'd like to achieve but, I wanted to attempt to be more creative this time. I just added some doodles and I actually love this page now! Extras & Weekly Spread - This month I decided to put my photo challenge into my journal. I've kind of been really bad at participating in my own challenge so maybe this will keep me more accountable. I also always leave a page of two for a brain dump (a space for random notes, doodles, thoughts). Last but not least, my weekly spread. I'm pretty happy with how this turned out! I'm going to use the little rectangle in the top left corner for big events during the week. The blank grid in the bottom left corner is a sleep tracker. I tried doing a full sleep tracking spread a few months ago and never filled it out. So, I'm going to try to do it weekly. The four sections in the middle are for things I need to-do, to blog, to buy, and ideas for the week. And, the last grid on the left page is just a mini habit tracker! On the right-hand side we have the start of my daily spread. I don't do my daily sections ahead of time. 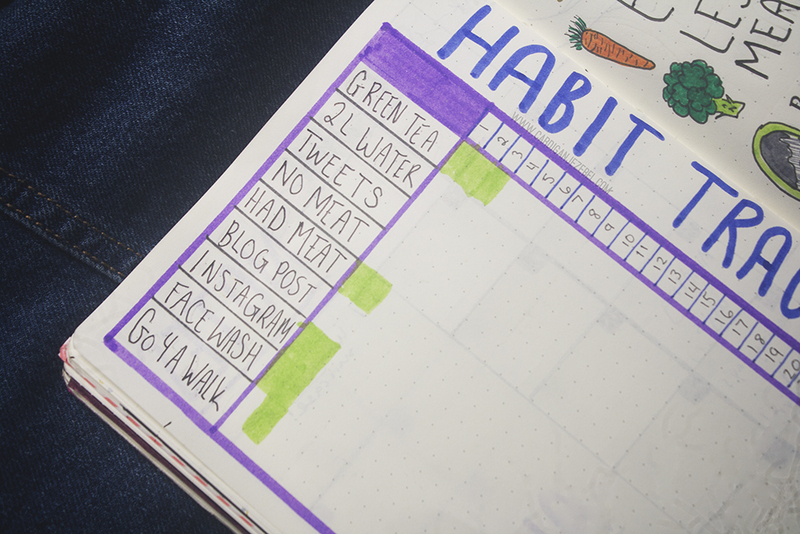 I like to do little habit trackers daily as well. 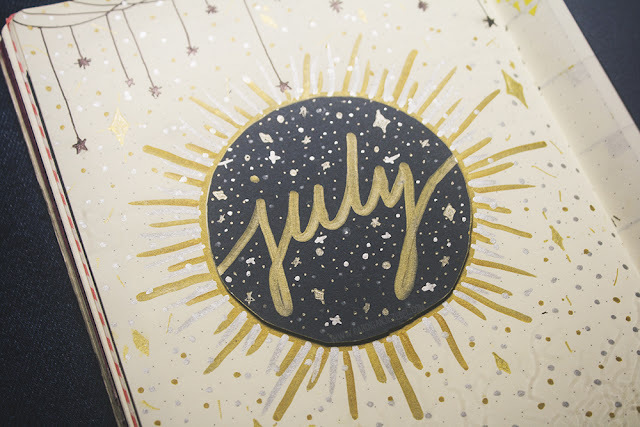 That's it for my July bullet journal set up! Please let me know if you liked this post because I would love to start doing more bullet journal posts! 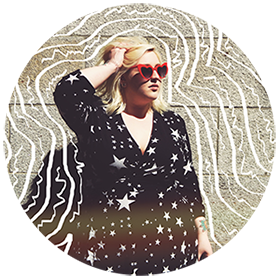 Also, keep an eye out on my Instagram for more bullet journal updates! 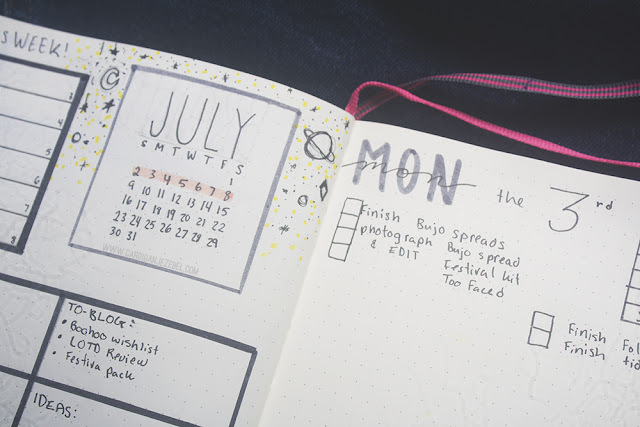 Do you use a bullet journal?